After more than 200 posts under the Homemade Wilderness banner, I finally offer you our first personal report about the landscape changes on our property. 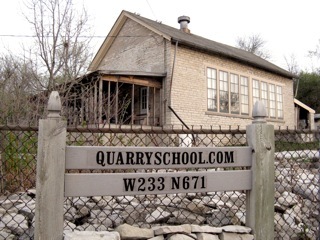 In case you haven’t looked into our biography here, I’ll explain briefly that Dan and I have been renovating the schoolhouse and grounds we inherited from my parents. Every element, inside and out, has been — or soon will be — carefully tended to in order to render a historically accurate and durable and attractive and functional place to live out our days. 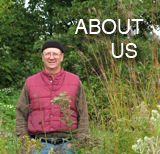 Last year Dan took chainsaw to utility poles and created dimensional timbers from which we constructed raised beds for the kitchen garden on the south side of our stone home. I had enough topsoil available to get some vegetables to grow, but the planters looked a mite lean, and I certainly couldn’t have grown a straight carrot. A couple days ago I began tackling two projects at once by harvesting lovely, fluffy topsoil from where it had gathered against the chainlink fence that separates us from the highway and relocating it to the kitchen garden. Hills slump. That’s actually the term for how soil migrates down slopes and gathers in lower areas. And that’s how the silty stuff gathered where it had. 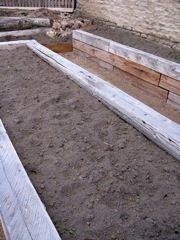 Happily, I can save the old fence from ruination while supplying the beds with respectable soil. 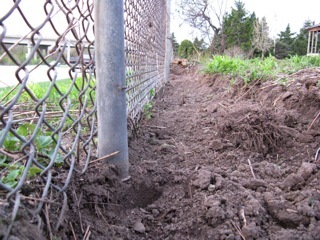 Admittedly, the soil will need more organic matter, so we’ll eventually get around to hurrying up our compost heap. However, our to-do list is longer than yours, I’ll wager, so churning compost is not a priority at this time.